Conceived around four years ago, the much-awaited Rs. 600-crore Huda-DLF sector road is expected to be completed within the deadline of September 2014 despite the delay, an official said on Thursday. The 8.3-kilometre road that will allow signal-free travel from the Delhi-Gurgaon toll plaza to Golf Course Road will be constructed by June 2014, said S Roy, vice president, DLF corporate communications. Construction major IL&FS has been awarded the contract for the 16-lane road which will reduce the travel time on the stretch from 30 minutes presently to seven minutes. "The road will cater to approximately 15 lakh commuters, including corporates and residents," said DLF officials. The road extends from Gateway Tower on NH-8 to the end of Sector 55-56 and is designed to accommodate higher traffic volume. The corridor would be fully integrated with the Rapid Metro system. Residents of DLF Phase I, II, IV and V, condominiums such as Belvedere Park and Belvedere Tower, Sector 55, 56 will benefit from the project. NEW DELHI: A 16-lane dedicated corridor in Gurgaon will link DLF's Gateway Tower in Cyber City to the Golf Course Road, offering some relief from crumbling infrastructure in Delhi's suburb. India's biggest real estate player DLF, which has a majority of its assets in Gurgaon, will build this 8.3 km-long road in a joint venture with the Haryana Urban Development Authority. The two are expected to spend Rs 400-600 crore on the project that will include eight underpasses and a long flyover enabling commuters to reach the Golf Course Road from the Gurgaon toll plaza within seven minutes. This stretch usually takes 30 minutes. Nearly 1.5 million residents and commuters from outside of Gurgaon who work in the city's numerous corporate offices have been complaining of nightmarish infrastructure for years. The city's main office district Cyber City has been a both traffic and parking nightmare for people who work for companies such as Microsoft, Coca-Cola, American Express, IBM, Hewlett Packard, Pepsi, Dell, Nokia and Google. "The objective is to provide optimum solution for traffic movements in the area based on present and projected traffic demand in future. This will be a signal-free movement from the toll gate to sector 55/56 and underpasses have been conceived considering urban environment to make it environment friendly," says Rajeev Talwar, executive director at DLF. DLF has high stakes in the development of infrastructure in Gurgaon. To ease congestion and to aid people who work in the Cyber City area where DLF has office buildings, the company had initiated India's first private rapid metro rail project to connect the Delhi metro to the office district here. This will be operational by mid-2013. "It will become more attractive for corporate tenants and DLF will be able to charge a premium on rentals and home prices as access would have become better," says Anuj Puri, managing director of property consultancy Jones Lang LaSalle India. With improved access and infrastructure, DLF will be able to charge at least 5% more rentals. Gurgaon's urbanisation started with DLF building residential colonies in the 1980s, but the city – which grew into a hub of multinational companies, including outsourcing firms, after the economy was opened up a decade later – didn't build enough infrastructure to cope with the demand. The new road project will be fully integrated with the alignment of the rapid Metro. It will also develop six-lane carriageways on both sides of NH-8 from the toll plaza to the DLF Square building to streamline traffic and feed into the 16-lane road. DLF has hired global design and planning firm AECOM to undertake a study on traffic, infrastructure and urban planning improvements for Gurgaon, based on which the final design plan has been prepared. The process of bidding for the project is on and construction companies such as Lanco, L&T and Punj Lloyd have shown interest in the project that is expected to be operational in the next 36 months. Gurgaon, also known as the millennium city, has attracted big multinational and IT companies to set up offices here because of its quality office buildings and proximity to the airport. With offices, came residential projects, but infrastructure has remained woefully inadequate. "The 16-lane corridor would be signal free, providing free movement for commuters on either side and will feature six underpasses that would reduce noise pollution. There is also a dedicated corridor for sector 25 to sectors 55 and 56, which will mitigate traffic and thereby enable smooth flow of main traffic. The estimated project cost will be Rs.540 crore and completed in three years," the official added. Soon, you can zip through Cyber City without worrying about traffic jams as the construction of a big-ticket road project is all set to begin today. Christened Huda-DLF Sector Road, the Rs. 600-crore, 16-lane road will connect the the Delhi-Gurgaon toll plaza to Golf Course Road. Conceived around four years ago, the project had received in-principle approval from the Haryana government in 2008 at a total estimated cost of Rs. 347 crore then. With 16 lanes, the 8.3-km stretch from Delhi-Gurgaon toll plaza to the Golf Course Road will reduce the travel time from 30 minutes at present to seven minutes. The contract for the construction was awarded to the Infrastructure Leasing & Financial Services Limited (IL&FS). Four companies (IL&FS, L&T, Punj Lloyd, Lanco) had submitted their bids on May 3 for scrutiny by leading project management company, Parsons Brinckerhoff. The Haryana Urban Development Authority (Huda) and realty major DLF signed an agreement in September 2011 to construct the road on a 50:50 cost-sharing basis by 2014. DLF officials said the project will be completed within the stipulated time. A revised concept study had been submitted by global design and planning firm AECOM last year. Design and engineering firm WSP was working on the project earlier. With six underpasses and a flyover at the Sikanderpur junction, the project, once completed, will ease daily traffic snarls in Cyber City — a corporate hub with firms such as Pepsi, Dell, Yahoo, Google, Microsoft, Coco-Cola, Hewlett Packard, Nokia, American Express, among others. A dedicated corridor for commuters going from Sector 25 to Sector 55/56 will mitigate the traffic conflict. The construction plan also takes note of the expected increase in traffic volume along the Golf Course Road and the Southern Peripheral Road (known as the Golf Course Extension Road) over the next few years. Dedicated utilities corridor will be constructed for sewerage, electric lines and telecom cables to avoid digging for maintenance. State of the art landscaping and road furniture will be the other highlights. With a toll-free link in the making, experts believe corporate and residential rentals along the road are likely to witness a substantial hike. The Huda had agreed to bear Rs. 162 crore of the cost out of the initial estimate of R347 crore in 2008 when the project was conceptualised. The DLF group will bear the remaining cost. Golf Course Road, with residential projects by major developers in Gurgaon, such as DLF, Emaar MGF, Unitech Group, Ansal API, BPTP Ltd, and many more, sports a premium tag in the city. Any developments near a Golf Course in any city, is considered a premium area. In Gurgaon, the DLF Golf Course is the only one within the residential limits of the city. All others such as the Classic Golf Course are along the Expressway, away from the main city. In addition, the size, scale of lifestyle features and the connectivity to the rest of the city and to Delhi, makes the Golf Course Road a preferred residential destination. Both the middle and high income groups are investing in this stretch. The middle income groups have a large pool to choose from, in the Cooperative Group Housing Societies in Sectors 55, 56 and 57. Privately built apartments such as the Pinnacle, Icon, Aralias etc from the DLF group are in the Super Premium category. All of DLF Phase V comes in the upper middle category. The ongoing capital value of apartments in this locality is between Rs 8,000 and 10,000 per sq ft. The rental value of apartments is approximately from Rs 30 to 32 per sq ft. The reasons for this are the presence of a good social network and location advantage. According to MagicBricks data, the capital value of multi-storey apartments has increased by 7% in the April-June quarter compared to January-March quarter. On the other hand, the rental value of apartments has witnessed a rise of 10% in the same period. Rental values in this locality have witnessed a steep increase owing to demand for rental housing as many people are looking for comfort of living when they migrate to Gurgaon for jobs. Being in close proximity to several commercial buildings, the premium residential units are sought after by employees in this area. Deepak Ruhil of Base Realty posted on MagicBricks site that the Golf Course Road is one of the prime roads in terms of projects by various top builders and also in terms of the value of land/apartments. “In future, the locality will give very high return on the investment of residential and commercial properties. The widening of road to six-lane /service lane is awarded to DLF/ IL&FS.” Ruhil added that the DLF metro line will be covering the road up to Extension road and will have the best connectivity to Delhi as well other parts of Gurgaon. GURGAON: In a possible relief to the residents and office goers between the 9.5 km- stretch between Shanker Chowk and Sector 55/56 crossing, the logjam on revenue sharing between the Haryana Urban Development Authority (HUDA) and DLF Ltd has ended with the state government sanctioning the Rs 347.24 crore project. "We have got the approval and are preparing necessary documents for signing of the agreement, which will be done soon," confirmed HUDA administrator Nitin Yadav. According to the decision, the project will have a 50-50 sharing between the HUDA and DLF, limited to external development charges (EDC) with the HUDA.The HUDA will put the cost collected under the EDC head and the balance amount will have to be paid by DLF. The project is a public-private partnership venture, which has to be completed within 36 months from the date of signing the contract. DLF will have to maintain the road for five years from there on. The sanctioned road upgradation project is for a 60-metre-wide road that will include widening and strengthening of the stretch between the two points. The project highlights the other additional structures to be put in place like underpasses and flyovers. The first flyover in the city, other than the expressway, is planned at the Sikanderpur Chowk which will be a unidirectional three-lane flyover. The second is to come up at Sector 42/43 Chowk which will be a six-lane bi-directional flyover. The city's first underpass planned at Gateway Towers will be bi-directional and have four lanes. A second underpass has been planned at Sikanderpur Chowk with six-lanes and will facilitate traffic movement from both sides.The plan had been approved earlier but was sent back to the state government for a revision. This arterial road connecting NH-8 near Shankar Chowk to Sector 55-56 via Cyber City and Golf Course road is in a bad shape at present. The road which connects residential colonies in DLF Phase III and few other condominiums on either side is dotted with potholes, leading to frequent traffic jams. To add to this, the ongoing construction work of Rapid Metro leaves the road blocked throughout the day.The recent rains have also partly washed away a substantial portion of the road in front of the City Court leaving barely a car's space to move at a time. Till now, the responsibility of maintenance of the road was with HUDA. Until the project is allotted, commuters will have no respite from regular traffic jams till at least the end of this rainy season. Golf Course road comes to mind instantly when we talk about a prime location in Gurgaon. Golf Course Road has gained the reputation of providing some of the finest projects with prominent builders of the likes of DLF, Emaar MGF, Unitech Group, Ansal API, BPTP Ltd, and many more having their presence in this area. The surprising fact is that it is not only the high income group (HIG) who are investing in this locality the middle income group (MIG) too, have bought apartments here. The reasons for this are the presence of a good social network and location advantage. The ongoing value of apartments in this locality is between Rs 8,000 and 10,000 per sq ft.
As for rental values, the range is between Rs 40,000 to 50,000 for a 2 BHK. Rental values in this locality have witnessed a steep increase owing to demand for rental housing as many people are looking for comfort of living when they migrate to Gurgaon for jobs. Sectors 27-28, 42-43 and 53-56 are essentially HUDA (Haryana Urban Development Authority) sectors. In Sectors 54-56 most of the plots have been handed over to the societies. Essentially, each society has one acre of land. This is demarcated into plots of sizes 1,250-2,825 sq ft. The price range varies from Rs 55 lakh to one crore. CGHS (Cooperative Group Housing Societies) apartments are available in Sectors 27, 28 and 53. A 3BHK apartment of 3,000 sq ft costs approximately Rs 1 crore. 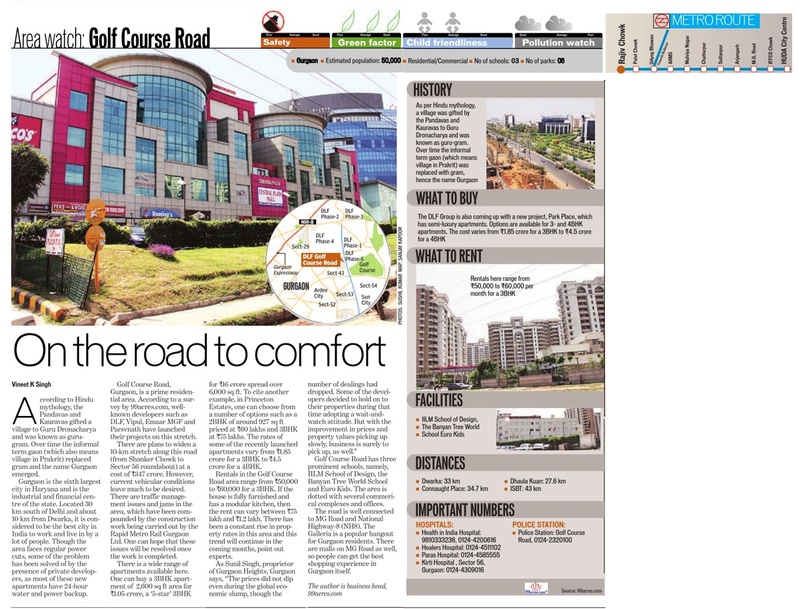 One of the many residential options in the Golf Course Road is Gesco Mahindra’s Central Park. This has semiluxurious apartments. A 3BHK plus servant room costs approximately Rs 7,200 per sq ft. These apartments have an exotic view of the Golf Course. Another project, by the DLF Group – The Blaire – also has luxurious apartments. Current market price of a 4BHK apartment of around 3,000 sq ft is approximately Rs 6,500 per sq ft. The DLF Group is also coming up with another project, Park Place, which also has semi-luxury apartments. Options are available for 3 and 4BHK apartments with a carpet area of approximately 3,000 sq ft. Current market price of these apartments is around Rs 4,500 per sq ft. The Golf Link Apartments belong to the CGHS category. A 4BHK apartment of approximately 2,000 sq ft is available in the secondary market for approximately Rs 70 lakh. At Princeton Estates, investors can choose from a number of options, claims Atul Sharma. A 2BHK of around 927 sq ft is priced at Rs 53-54 lakh; a 2+1BHK is available at Rs 60 lakh; A 3BHK apartment of approximately 1,346-1,410 sq ft is priced at Rs 72-78 lakh and a 4BHK apartment of 1,810 sq ft is available for Rs 85-90 lakh. The entire stretch of the Golf Course Road is well connected with arterial roads such as MG Road and NH-8. It has bus as well as auto services from these arterial roads. The commuting problem for domestic helps for the residents staying nearby has largely been solved due to this. Galleria – a shopping arcade – is a popular joint for Gurgaon residents to hang out in the evenings. Although there are regular power cuts, the problem has been taken care of by the private developers, as most of these apartments have 24-hour water and power backup. One just needs to stop by at the Golf Course Road and check out the options available for their sweet home. The issue pertains to sharing the cost of the project, in case of any design expansion. Senior HUDA officials claimed that both sides will discuss the matter during the meeting. The crucial meeting is scheduled to take place on March 15 and will decide the fate of this ambitious project. Earlier, the HUDA had chalked out the project cost to be Rs 346 crore. The cost of the project will be shared by the HUDA and DLF. The HUDA had incorporated every aspect of the project including delays due to unforeseen reasons. The DLF officials hinted at the possibility of cost sharing by the HUDA in case of design changes, inflation and operational delay. But the civic authority is no mood to agree for cost sharing beyond its commitment of Rs 173 crores. No final decision has been taken about the agreement, but there is no question of committing more money for the project, said a senior HUDA official. HUDA says its share of the money will come from the External Development Charges (EDC), that is used to develop infrastructure in the city including roads, highways and metro. DLF, meanwhile, will construct and maintain a 7km stretch of road from Shankar Chowk till the rotary, after the DLF golf course. The entire stretch would become signal-less and will have several underground and over ground crossover and flyovers. It will also boast fancy bus stops, pavements, footpaths and signages. GURGAON: After finalizing the project cost for the widening of Golf Course Road, the Haryana Urban Development Authority (HUDA) and DLF are now squabbling over the issue of who would bear the additional expense in case there is a cost escalation. The HUDA has worked out Rs 346 crore as the total project cost. Sources said the authority would invest about Rs 160 crore and rest of the project cost would be borne by the private developer. The seven-km long road from Shankar Chowk till the rotary after the DLF Golf Course will be developed under the PPP model. Sources said all the operational aspects were factored, including the possibility of a delay in completion due to unforeseen reasons, while deciding the cost of the project. HUDA sources said the state government had vetted the price calculation method adopted for this stretch. However, DLF has now moved a proposal to the HUDA to rework the project cost. Government sources said DLF wants the HUDA to share the cost burden in case the project overshoots its deadline and there is any escalation in price. Sources also said it is for the first time that the HUDA has roped in a builder to build a colossal project involving roads, flyovers and underpasses. Except sharing the total project cost to some extent, we will not share any additional amount due to escalation of expenditure. We are rather of the view that the HUDA should penalize the developer if it fails to complete the project in time. This is a practice in case of almost all infrastructure projects, said a senior HUDA official. He added that they have informed the state government about their reluctance to share the additional cost burden. The HUDA is contributing about Rs 160 crore from its pool of External Development Charges (EDC). The EDC is used to develop infrastructure in the city including roads, highways and Metro. Sources said the HUDA had originally planned to develop this road with its own investment. However, soon after the proposal was mooted, DLF pitched in with an offer of investment to make the stretch a world-class road. They had approached us stating that this is an important stretch for them and hence they will invest for the project, said a HUDA official. The ongoing tussle over cost projection has thrown the project out of gear. Once the project is completed, the entire stretch would become signal-free. The stretch will be aesthetically redesigned with -state-of-the-art bus stops, pavements and signage. The project is likely to benefit DLF immensely, as most of its upcoming housing colonies are on this stretch. Several commercial projects and business centres are also on this corridor. HUDA administrator will now draw an agreement between the authority and private developer DLF to share cost on 50:50 basis. an eight-lane, signal-free road from the Shankar Chowk crossing on Gurgaon Expressway to the Sector 56 roundabout on Golf Course Road would make traffic jams a thing of the past. Haryana chief minister Bhupinder Singh Hooda accorded approval to the project costing R346 crore on Wednesday that would be developed by Haryana Urban Development Authority (HUDA) and DLF Group on cost sharing basis. The project would have two flyovers and three underpasses as well as service lanes along the main road spanning 6.5 kilometres. 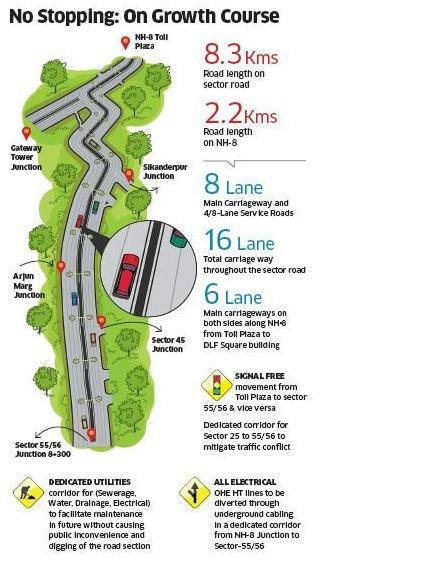 This is likely to ease traffic movement on Golf Course Road, Faridabad Road, MG Road and DLF Cybercity. According to HUDA chief engineer VK Gupta, the authority administrator would now draw the agreement to be signed between HUDA and DLF listing out the terms and conditions to share cost on 50:50 basis. A committee of officials from both parties will be constituted for floating global tenders for the project. The project is likely to be completed in three years after the award of the tender. The underpasses would come up on the busy Sikanderpur Chwok on MG Road and Genpact roundabout from where a road leads to Faridabad. The flyovers will come up on the MLA flat crossing, Sector 43 crossing and Sector 56 roundabout. Residents of DLF City Phase 1, 2,3 and sectors 27, 28, 42, 43, 56 would be the immediate beneficiaries of the project. Executives working in DLF Cybercity, the hub of various multi-national companies, would also benefit from this nostops highway. In addition, the 6.1-km Gurgaon Rapid Metro Train project is also likely to be ready by January 2013. GURGAON: In an important development, the Haryana Urban Development Authority (HUDA) has worked out the contract price of Rs 346 crore for developing Shankar ChowkGolf Course Road in Gurgaon. The details of the ambitious projects including map and designs have been finalised and the project details have been sent to state government for final clearance. The DLF has been selected for developing the project. Over 7 km long road from Shankar Chowk till the Rotary after the DLF golf course will have no traffic signals. A senior HUDA official said that the price of the contract has been worked out after going through a number of projects executed by the HUDA in Haryana. The project will have four flyovers and underpasses. According to estimates, on completion, the road will unburden the heavy traffic rush of NH road and MG road. It is not just construction but the DLF will also carry out all the maintenance related work of the project after its completion. HUDA sources admitted that the completion might take over 2 years but the work will start off sometime this year. The entire stretch will be aesthetically redesigned with proper bus stops, pavements, footpaths and signages. There will be different types of underpasses on the stretch: one will be open, while others will be covered and there will be four lanes flyover to ensure that the vehicles dont need to stop anywhere between Shankar Chowk to last Rotary after the DLF Golf Course, said a DLF executive. Residents, meanwhile, are happy because the road, at present, is in dire state. The heavy monsoon showers damaged the entire stretch of the road. It is very pleasant to know that the DLF will now be taking over and developing it. This is something which should have been done long time back, said Anu Goel, a resident of Gurgaon.